Used primarily by the owners' 7 year old son, the goal was a bright, cheery space that reflects the home's original style. We framed the son's art to add to the playfulness. The new plumbing fixtures were chosen for their sleek, contemporary look and water use efficiency. This fixture is luxurious yet economical. This new home was built with an unfinished basement. The plumbing had been roughed in, so we were simply completing the unfinished space. It was a challenge to create a well-designed, functional and aesthetically pleasing bedroom/bathroom suite, rumpus room, wetbar, and wine cellar within the budget constraints. But it turned out incredibly! 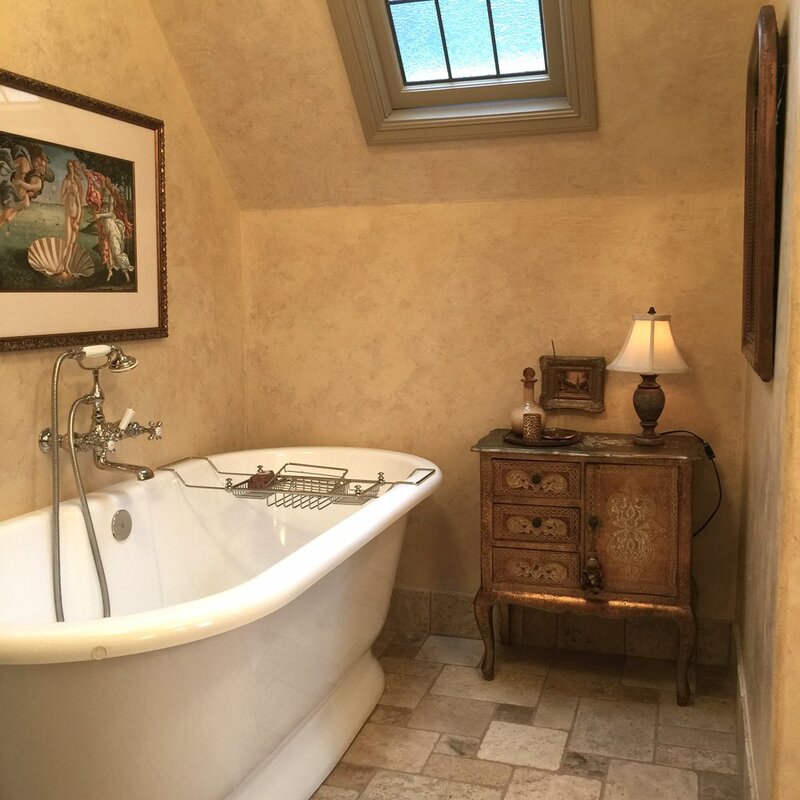 Featuring wonderful original tile and existing architectural details, the bath was updated by adding period-specific fixtures. This bathroom looks like it's been there since the house was built. 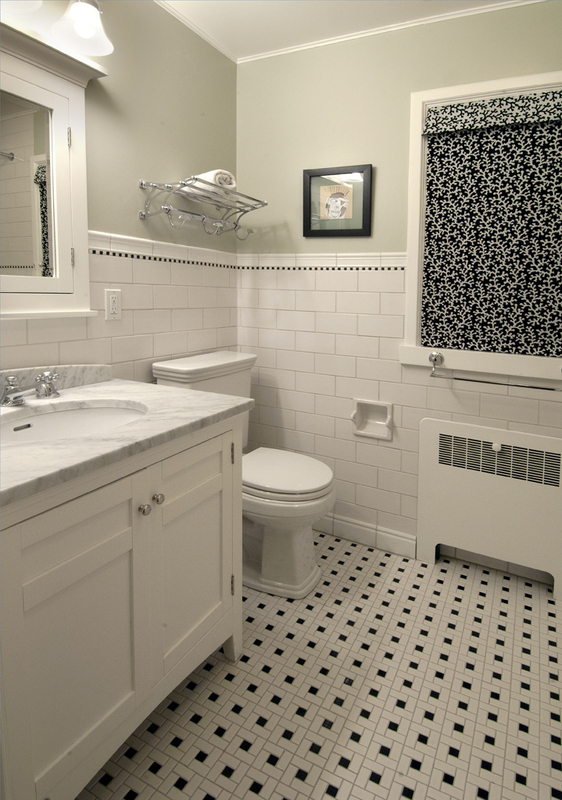 We used white subway and one inch hexagonal tiles with black accents to create a period feel and designed custom cabinetry to maintain the vintage style. A Roman shade was added, made from Perrenials outdoor fabric, to provide mildew-proof protection from the afternoon sun. Now the tiny guest bath is a bright, airy, clean-feeling room. We found a stone remnant and had a new countertop fabricated, added a glass mosaic backsplash, new plumbing & light fixtures and had the walls glazed with bronze metallic paint. The owners of this home are tall and could not really see into the wall-mounted mirror very well. The solution was to mirror the entire wall.Success! 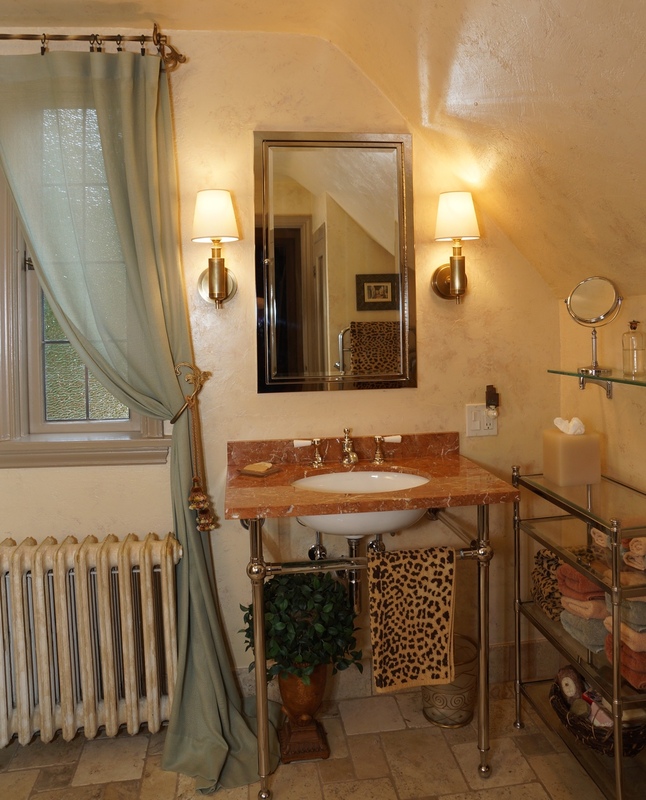 We also installed a new, beautiful marble slab, new sinks and new plumbing hardware to create a restful sanctuary. From what was once a child's room, this master bath has it all. It was important to respect the era of the home and still update the tiny, tiny bathroom. We used ceramic tile, marble and porcelain tile. New, efficient plumbing fixtures were installed.